"And the Animals Came Two by Two". Noah's Ark is the theme of this whimsical birth record. 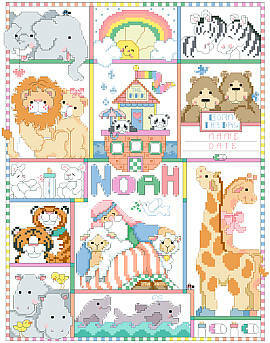 Designed by Linda Gillum, it features pairs of your favorite animals. From Bees to Zebras, they are ready to declare Baby's arrival. Contents: Stitch count 140w X178h, Finished size on 14-ct: 10" X 12-5/8"